You don’t need a mantle to hang stockings this holiday season - use bright, glossy Krylon® colors to create a standing stocking holder! Attach a stair newel to a wooden round by drilling five long wood screws through the bottom of the round into the base of the newel to create a stand. Spray the stand with Krylon® ColorMaster Paint + Primer in Gloss Almond. To achieve the pictured look, spray 3 coats. 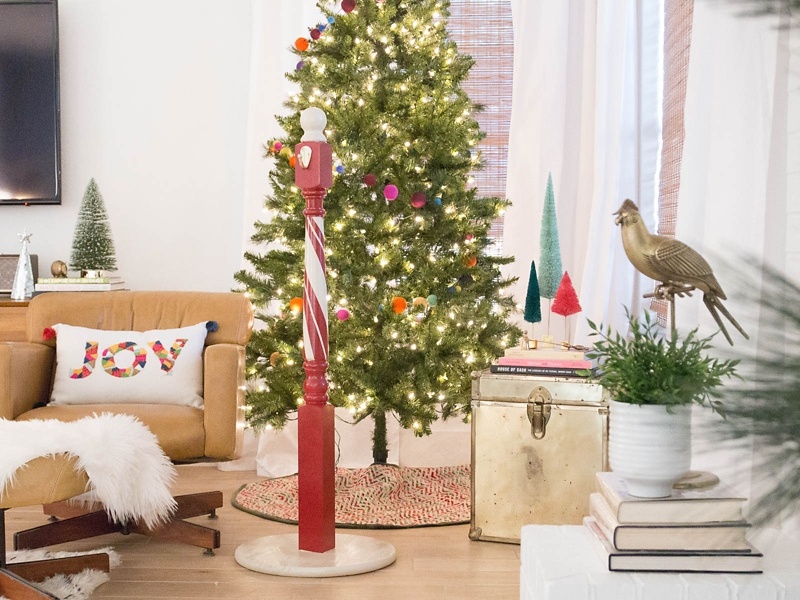 Once the Gloss Almond is fully dry, use three different widths of painter's tape to create a candy cane swirl down the middle part of the stand. Cover the top of the post and bottom wooden round with a plastic trash bag to protect from overspray. Paint the exposed areas with Krylon® ColorMaster Paint + Primer in Gloss Cherry Red. For pictured look, spray 2 coats. Once the Gloss Cherry Red is dry to touch, remove the painter’s tape. Allow to fully dry. Screw a brass wall hook in on each side of the top of the stand.